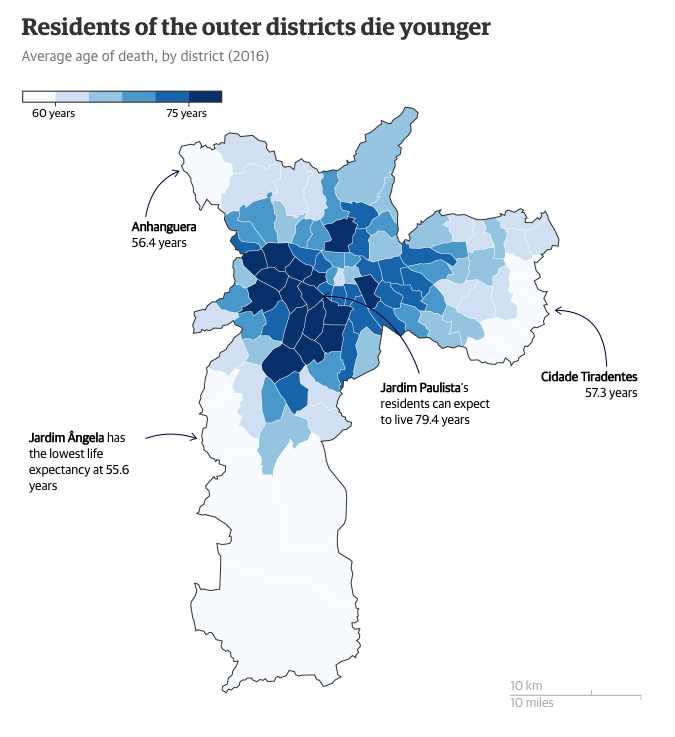 According to a new report on inequality in the Brazilian city of São Paulo, compiled by Rede Nossa São Paulo (pdf, in Portuguese), the gap in the average age of death between the poorest and richest districts of the city is almost 24 years. Thus, for example, the average age of death in Jardim Paulista is 79.4 years while that of residents of Jardim Ângela is only 55.7 years. 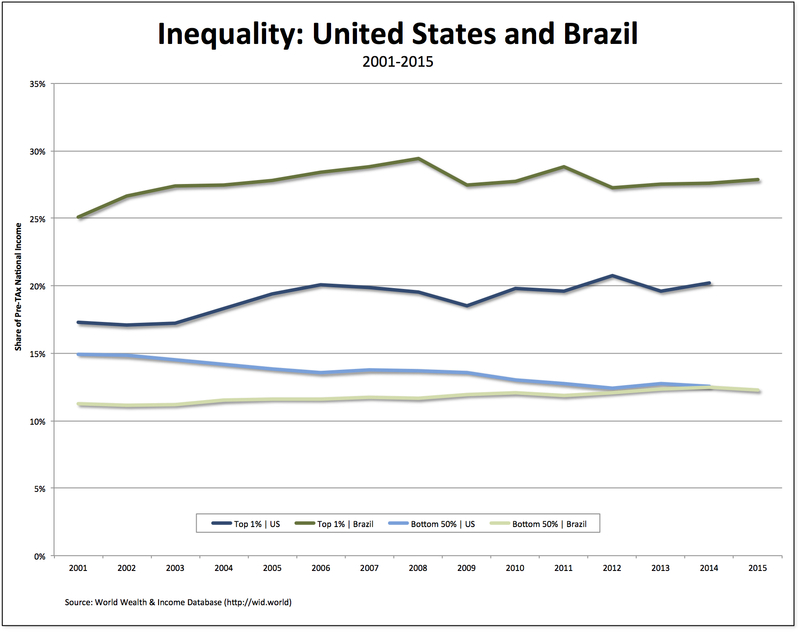 This should come as no surprise since Brazil is one of the most unequal countries on the planet. However, lest we forget, the United States is also characterized by levels of inequality that are comparable to those in Brazil: in 2014, the top 1 percent of Americans captured 20.2 percent of pre-tax income, while their Brazilian counterparts managed to take home 27.6 percent. Perhaps even more damning, the share of income of the bottom 50 percent of both countries—while rising in Brazil and continuing to fall in the United States—was only 12.5 percent in 2014. As it turns out, the obscene levels of inequality in the United States have resulted in a life expectancy at birth that is lower than most other high-income countries—and the gains in future years are expected to lower than in most other countries. Notable among poor-performing countries is the USA, whose life expectancy at birth is already lower than most other high-income countries, and is projected to fall further behind such that its 2030 life expectancy at birth might be similar to the Czech Republic for men, and Croatia and Mexico for women. The USA has the highest child and maternal mortality, homicide rate, and body-mass index of any high-income country, and was the first of high-income countries to experience a halt or possibly reversal of increase in height in adulthood, which is associated with higher longevity. The USA is also the only country in the OECD without universal health coverage, and has the largest share of unmet health-care needs due to financial costs. Not only does the USA have high and rising health inequalities, but also life expectancy has stagnated or even declined in some population subgroups. Therefore, the poor recent and projected US performance is at least partly due to high and inequitable mortality from chronic diseases and violence, and insufficient and inequitable health care. In the case of both Brazil and the United States, the poor will continue to die younger unless and until the fundamental causes of economic inequality are eliminated.